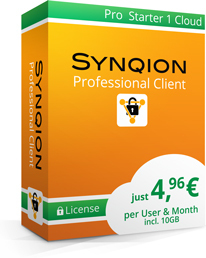 The license included for 1 user allows this 1 user to run Synqion on any number of computers, tablets or smartphones. The license can be extended to include a greater number of users. The 10 GB of cloud storage space is located within the cloud in the US. It may be used by any number of users. The size of the storage space can be increased now or at a later date. You can control which users are able to set up new Spaces in your storage area.